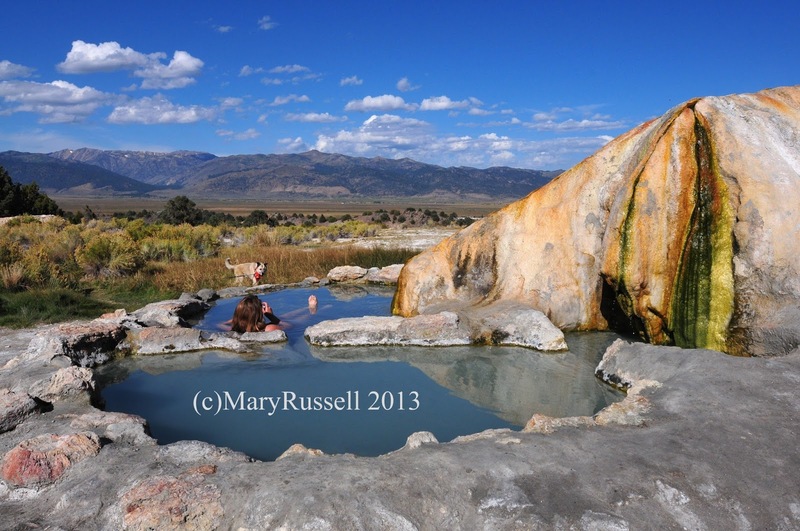 Inspired by a fellow Bloggers pics from last fall, I was intent on finding the Travertine Hot Springs near Bridgeport, CA. After leaving Carson City, I headed back south down Hwy 395 and made another stop at the Bridgeport Marina Campground. 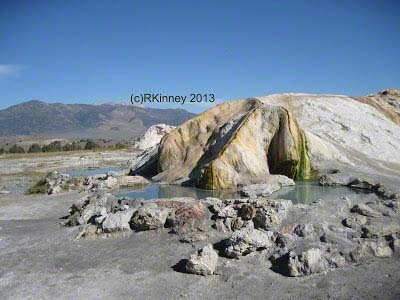 There are several Hot Springs in this area but the Travertine Hot Springs are just about a mile south of town and fairly easy to find. 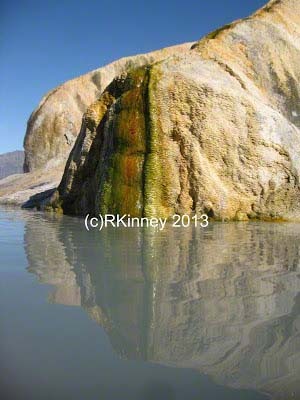 My first trip to springs was in the evening My friend Mary & I found 5 guys in their birthday suits soaking in the bigger pool, so we explored some of the nice reflections on the other pools until they headed out. The Springs are up on a hillside and the views of the sunset over the mountains was wonderful. In addition, to the 4 upper pools that are grouped together, there is an additional oval pool in the top area and at least one lower pool. We returned the next morning to explore some more and have a nice soak. We had the place to ourselves for about a half hour until a few folks started trickling through. Every one was respectful of each other and sort of spread out and let each set of folks have their moment to soak in the water and enjoy the sights. 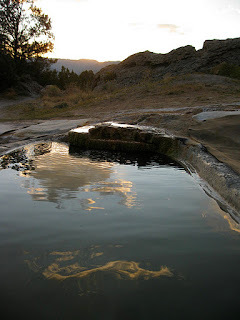 I am not big on the Hot Springs that they turn into swimming pools, so I found this area quite refreshing. I will definitely return for some R & R when I am in this area again & now count Travertine among my favorite natural Hot Spring spots. Can't wait till my next soak! To get to the Springs, you take Hwy 395 south from the town of Bridgeport for about a mile and a half, then turn left on Jack Sawyer Rd. You won’t go very far before the road turns to dirt. There was a fork in the road here, which I took to the left. The road was gravel & rutted but certainly passable in drive weather in my passenger car. I saw no signs directing to the Springs but there is sign posted when you get there. There are at least two parking areas. 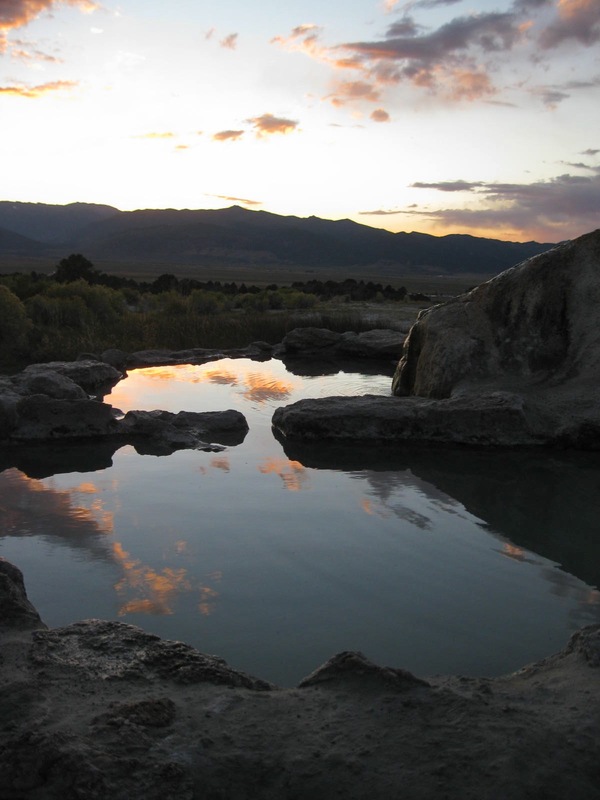 The Springs are on BLM land and are free. 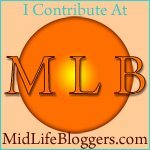 I found folks in suits and folks in their birthday suits, just something to be aware of, especially if you have kids. I saw no one with kids visiting or soaking. There is no camping allowed at the Hot Springs but Bridgeport Marina Campground is a nice place to stay. There are great views of the reservoir, the folks there are very friendly plus they revamped their wifi over the summer and added cable TV. Nice additions to an already great place to relax. My fellow Blogger, Diana's post on Travertine and other Bridgeport area Hot Springs can be found here. That's an interesting post. I didn't know about the hot springs. Sounds like you had a nice relaxing time. Sounds like a wonderful place and I'll definitely keep it in mind. I could use a good soak. 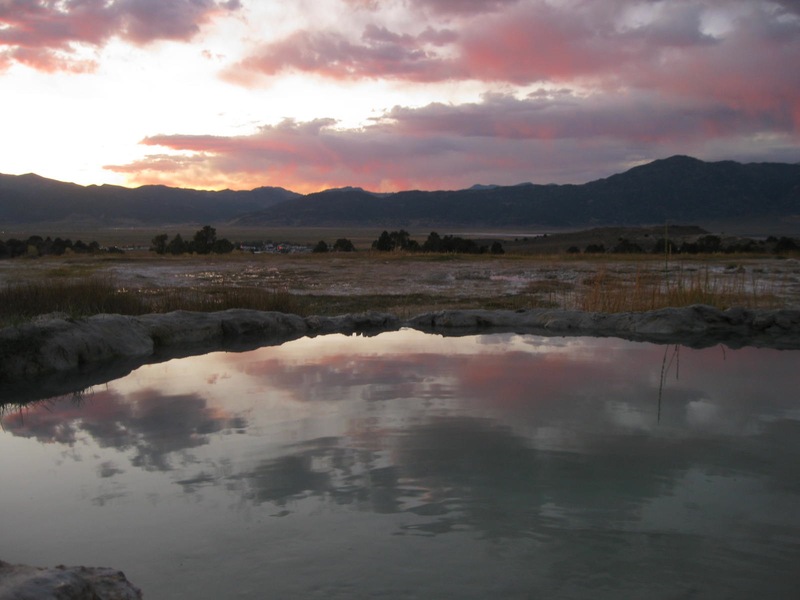 I love hot springs or thermal pools. This one looks lovely. They have lots here in Mexico but they had been made into balnerios (water parks with pools) that get refilled each and every day rather than being left natural. I have never soaked in a hot spring, but right now, with the cold weather that blew inton Kentucky overnight, it sounds like a fabulous idea! You have discovered my favorite hot springs. Warm, beautiful locale and not hard too get to. Not over commercialized either. My favorite time was being there late in eve on a snowy day in Bridgeport, my hair was frozen but I was warm & toasty. Listening to a Church bell or town clock chime every hour in the dusk then dark; a day spent with my best friend in from out of town. It was pure magic.